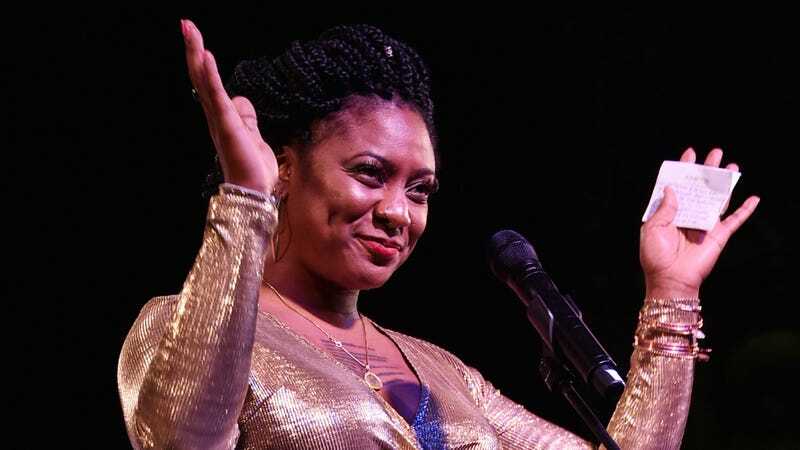 Activist Alicia Garza attends the Busboys and Poets’ Peace Ball: Voices of Hope and Resistance at National Museum Of African American History & Culture on January 19, 2017, in Washington, D.C.
She’s helped amplify countless black voices across the world, and now, Alicia Garza will have an even larger platform. The Black Lives Matter co-founder, who is also Director of Strategy and Partnerships at the National Domestic Workers Alliance (NDWA) and founder and principal of Black Futures Lab, is now the new contributing editor of women’s magazine, Marie Claire. Garza, whose writing has been featured in the New York Times, USA Today, Elle.com, and Glamour, will be writing a monthly column for Marie Claire that “is a call to action that seeks to engage and empower women, especially women of color, in the 2020 elections.” Her first column, “Women Are The New Face of Power,” appears in the April 2019 issue. And Garza’s already bringing other black women into the fold—like Dr. Brittney Cooper (Eloquent Rage), whom Garza invited to profile political phenom Stacey Abrams for the April issue. Notably, in Garza’s role as Senior Advisor for Care in Action, the policy and advocacy arm of NDWA, she helped lead the canvassing operation that resulted in record voter turnout for the 2018 Georgia gubernatorial race which Abrams narrowly lost—with black women voters leading the charge. Obviously, this will not be the last we see of Abrams—whose presence in the 2020 elections is as yet to be determined. But when it comes to dismantling white supremacy and fascism, Garza remains faithful that women get it done (black women, in particular). Is America Ready to Recognize Black Women&apos;s Transformational Power?